Being a landlord can be tough. Knowing what to charge, when to raise rent and how to find and retain the best tenants is a lot of work. If you aren’t seeing the profits you’d like, you can either walk away or do some of these simple things to add value. 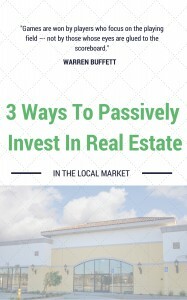 In our latest post, we will help you learn how to add value to your investment property in Las Vegas. Adding new fixtures to your Las Vegas house is an excellent way to increase the value. New handles, drawer pulls, and doorknobs will instantly update and modernize the look of your kitchen or bathroom. You can also replace the sinks and faucets to quickly and easily update your investment property. Imagine being a prospective renter coming to view the property. You would likely rather see a well-kept yard, with flowers, a freshly mowed lawn and an inviting seating area as opposed to a neglected, barren and dismal looking yard. If you want to add value to your Las Vegas house, it helps to have people fall in love with it from the minute they step out of their car. Adding storage to a house will add value to the home and make it more appealing to prospective renters. You could add shelving to a walk-in closet, or add a linen closet where there wasn’t one previously. People love a good closet and places to store away their things If your Las Vegas rental property lacks storage space, consider adding some to increase the overall value.